1. 2X FORTIFIED HAIR* Breakthrough formula features protein extracts that penetrate deep into every strand, leaving hair 2X fortified vs. uncolored hair. 2. ZERO AMMONIA, ZERO ODOR Say goodbye to that typical salon haircolor smell. The revolutionary Zero Ammonia formula means no odor, no discomfort—just amazing color. 3. 100% COVERAGE Your stylist can cover gray flawlessly while leaving hair shiny, conditioned and fortified. 4. MULTI-DIMENSIONAL, 4D COLOR RESULTS Hair is infused with long-lasting color that’s radiant and multi-dimensional—never dull or flat. 5. 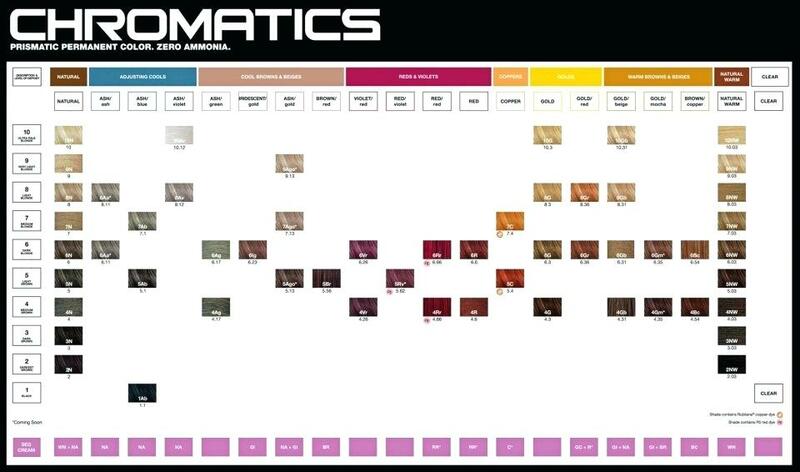 UNLIMITED COLOR POSSIBILITIES Chromatics features an incredible range of shades including brilliant brunettes, vibrant reds and beautiful blondes, so your stylist can custom blend a Chromatics color that’s perfect for you.